A series of earthquakes and the collapse of the crater floor at the Puu Oo vent on Hawaii’s Kilauea Volcano could trigger a new eruption of lava, officials said Tuesday. Scientists from the U.S. Geological Survey’s Hawaiian Volcano Observatory said that seismic activity over the past 24 hours could lead to a new breakout on the east side of the Big Island volcano. USGS geologist Janet Babb said similar activity has been recorded prior to previous eruptions in the area. In mid-April the observatory issued a volcano activity alert when scientists noticed the Puu Oo vent was inflating and becoming pressurized. 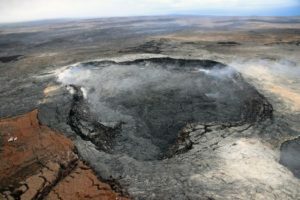 When the earthquakes and collapse occurred and the pressure within the Puu Oo vent was released, an “intrusion” of lava was sent into a new area of the volcano and spread throughout the night. There are homes in that area of the Big Island and Highway 130 leads to a popular access point where people can hike or bike into the lava viewing area. The Hawaii County Civil Defense Agency sent out an alert Tuesday morning warning residents in the area to monitor the situation and be prepared for the possibility of a new lava flow. Spokeswoman Kanani Aton said that the agency is “planning ahead for a worst-case scenario” by reviewing emergency plans and monitoring the activity in conjunction with USGS officials. All public access from the island’s Puna District near Kalapana has been shut down and visitors have been warned to stay away in case of an eruption. Private excursions including boat and hiking tours have also been suspended. Babb says the activity has slowed significantly since a spike on Monday afternoon and overnight, but the threat level has not changed. Scientists don’t know if decreased seismic activity is an indication that the event is over or if it’s just stalled and could pick back up. “That’s the unknown at this point. Therefore we are still watching, we are watching very closely,” Babb said. Geologists flew over the area and observed a layer of red ash covering the ground near the Puu Oo vent. The ash was spread throughout the area when the crater floor collapsed. “The good news is that as they flew down the East Rift Zone they didn’t see any ground cracks or steaming that would suggest that the magma was coming near the surface,” Babb said. Most of Kilauea’s activity has been nonexplosive, but a 1924 eruption spewed ash and 10-ton rocks into the sky, leaving one man dead. Puu Oo’s 1983 eruption resulted in lava fountains soaring over 1,500 feet high. In the decades since, the lava flow has buried dozens of square miles (kilometers) of land and destroyed many homes. In 2008, after a series of small earthquakes rattled the island, Kilauea’s summit crater opened and gushed lava and rock over 75 acres of the mountain, damaging a nearby visitor overlook.